“I hope you get better,” the nurse said as she left the room. I smiled and looked down. I wasn’t there because I wanted to get over the flu or because I had strep throat. While I had some poison ivy on my ankle, I wasn’t there for skin cream or itch relief. I wasn’t even there for a physical. In truth, I was there because I am, by all accounts, mentally ill.
It’s rather scary when it’s phrased like that. It feels as though calling myself sick implies that I’m not able to function or that I can somehow infect the people around me with my brain germs. Even as someone who has been rather outspoken about his struggles, there’s just something in the word “illness” that rubs me wrong. Unlike getting bronchitis or a sinus infection, you just can’t take an antibiotic, rest, and drink some orange juice to get better. “Getting better” doesn’t feel like a realistic option because “getting better” sounds like being healed. Over two years ago, I was diagnosed with Generalized Anxiety Disorder and depression in my therapist’s office. Years of undiagnosed struggles, unspoken insecurities, and unhealed pain brought me there. I couldn’t be in a car for more than ten minutes without panicking. I couldn’t get myself out of bed in the morning. I lost interest in just about everything. I wanted to harm. I wanted to quit. I wanted to end the thoughts. I remember telling my therapist all I wanted was to be better. If we use the deepest valley in my life as a benchmark, then I’m happy to report I got better. Much better. Therapy, medication, and God helped me through that darkness. I’m not suicidal anymore. I found direction in my life and a job I’m passionate about. I have a community that cares for me. By the fall of 2017, I was even able to come off my antidepressants. With so many tangibles, it’s easy to say that I was, and am, better. But, the truth is, I’m still not mentally healthy. While those benchmarks have been reached and are by no means tiny accomplishments, I’m still not healed. That dark place I was in wasn’t just from faults in my mental health, but rather the result of it absolutely spinning out. I am no longer falling apart, but it’d be dishonest to say I haven’t struggled since. People get anxiety, everyone falls into funks, and everybody feels sad sometimes. It’s normal. It’s the brain’s response to stress, heartbreak, and disappointment. The ability to react in a healthy way, to cope, to refocus, and to ground, are all things we are capable of doing. For me, my struggles translate to a loss of control and an inability to react with healthy coping mechanisms. At my peak of struggling, I feel as if I no longer live with my thoughts, but am controlled by them. Not so much in a brainwashed, super-villain-weapon-esque way, but in the way that I just get lost in my mind. Those anxious and depressive states lead me to feel like I’m taking a step away from reality and entering an area where my surroundings are moving but the only thing existing are my thoughts. If “getting better” is reducing the occurrence of those states, then by that logic I have gotten better. I’m aware of what makes me low. I know my triggers. I know what it feels like when I’m slipping. My behavior, my outlook, and my happiness are blatantly different when I’m struggling versus when I’m not. Less bad days means I’m happier and being happier means I’m better. But mental health doesn’t work like that either. This summer was the best summer of my entire life; the happiest I have ever been. I worked with purpose, with fulfillment, and with community. I felt loved by those around me, my God, and myself. Even on the rainiest of days when I was tired and cranky there was no place I would have rather been. I truly was happy. Yet, I still had struggles. They weren’t seismic lows or anxieties that shook me to my core. There were no major triggers or feelings of slipping. I was able to pull myself through or at least distract myself long enough to get a hold on it. In all cases, they were just weird, abnormal feelings. But they existed. Which is what brings me back to that office with the nurse and the doctor. I had a backslide at the beginning of October. A bad one. The depression and anxiety were back with a vengeance. It was terrifying, but it prompted me to find new solutions. I didn’t want to submerge myself in pain and wait (or hope) for it to pass this time. Instead, I texted my therapist, emailed my pastor, and set up an appointment with that doctor to discuss antidepressants. Just as the nurse had wished for me, I too want to be better. But better, when it comes to mental illness, isn’t charted with benchmarks or being able to say “I’m cured.” Better for me is finding the best possible way to live and function while having struggles. I want to continue to grow and understand why my brain works the way it does. I want to learn how to prevent myself from closing off when I’m hurt. I want to put the work in and be able to stay rooted and confident in myself, my beliefs, and my mental state. I want to be the best me. At the end of the day, God made me this way for a reason. I may never know why, but he did. I was also made with the ability to grow while struggling, to love while hurting, and to be hopeful while falling. 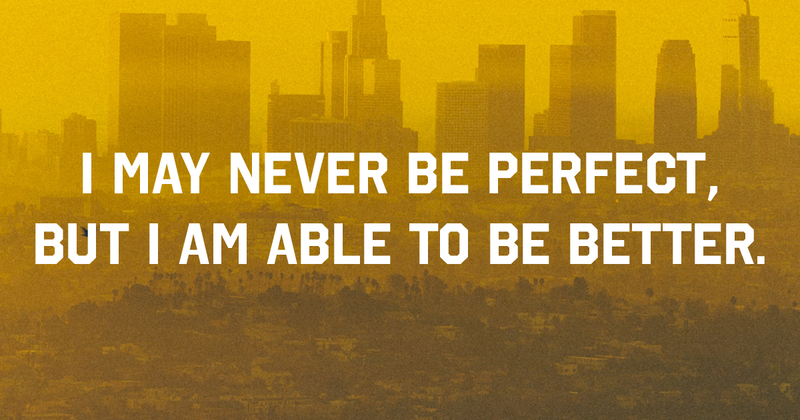 I may never be perfect, but I am able to be better. Wonderfully written expression from the heart. Thank you Alexander Milner. Very well stated, Alex. Thank you for sharing your story! Hey Alex, I can relate in the fact that I struggle with generalized anxiety disorder and depression. However, I am a hopeless case I feel when it comes to getting help. None of my family is on board with me getting treatment and I’ve exhausted all options. I’m running out of money and I have anxiety being around anybody. Everyday is filled with suicidal thoughts. I’ve grown up in the church and trust Christ as my savior, but I don’t see how my current situation gets any better. I know this is a lot, but would you offer any advice. We’re so glad Alex’s piece resonated with you. We’re sorry that you aren’t finding the support you need when it comes to your treatment and recovery. Our team would be honored to hear more of your story and offer you any support or encouragement we can. Would you email us at info@twloha.com? Thank you for sharing this. “Therapy, medication, and God helped me through that darkness” describes my journey very accurately and succinctly. I’m currently going through a backslide that reached its low point last Friday when I self harmed. Despite the voices of anxiety still screaming in my head, reading your article was the final push I needed to make the decission to reach out to those that can help (which also happen to be my therapist, pastor, and doctor). I can never thank you enough. Praying that your faith will stay strong, your healing may continue, that there be more good days than bad, and that you may continue to be a light for yourself and others. Thank you so much for sharing! I’ve been wrestling with this. Anxiety has always been in the background and depression has joined it. I was proud of myself for being very high functioning (I know it was just luck). Until I wasn’t. Your story helped me to understand that while I am not well right now, there’s a big difference between where I am and where I’m afraid I’ll end up. I just need to continue to learn what works for me and take it 1 step at a time. As much as feeling like this stinks, I have gained empathy. I work in the mental health field and these experiences are already shaping me into a better teacher. The reality of the mental health field is people tend to be more helpful when they’ve been through it. My counselor has a lot in common with me and it makes it easier to trust her and listen to her. I hope you and everyone reading this continue to move towards “better.” Hugs! Soo incredibly REAL, & relatable. You have given life to my experiences/ thoughts/ & feelings, …. but just didn’t quite know how to articulate it all in a way that made sense. NOW, I feel like I have the words, & an outlet, to express what I’ve been feeling for so long. Thank you, for helping me find PURPOSE in this journey. Something I’ve been hoping/praying for years to find. Each word, in the last paragraph of this article, is something I need to remind myself of every single day. Thank you… in more ways than words can ever say. BEAUTIFULLY said. Thank you so much. Thank u Alex for sharing . I am a parent of a 15 year old girl who is currently struggling with anxiety & depression. Reading your story gives me hope. Today, I share my story of survival. I did not believe that I would live to see my 18th birthday, yet here I am, living.